Once again 3D is hitting the iPhone with a fearsome tenacity that makes you just plain ignore regular phone users. But this time the 3D goodness isn’t in the iPhone, it’s on it… and it’s on it in a not-over-the-top-at-all, ultra-fashionable way. FreshFiber, with the styling skills of Janne Kyttanen, has launched a fresh line of iPhone cases created with the material layering intensity of a 3D printer. Yes, call your friends for a cute little iPhone party and prepare to get your hands on some of this stylish fab. Al from Develop3D got it right when he described this as ‘truly fascinating.’ 3D printing is beginning to spill into the wide expanse of consumer product design. These cases are a perfect example of how 3D printers are allowing people to extend the complexity and customization of designs. No word when the cases will be available or for how much exactly. In the meantime, if you’re interested in printing a case yourself, you may want to check out a chunkier style iPhone Case from Make-Parts. Download it and print away. These case designs are one reason why you may need an incredible 3D iPhone model. 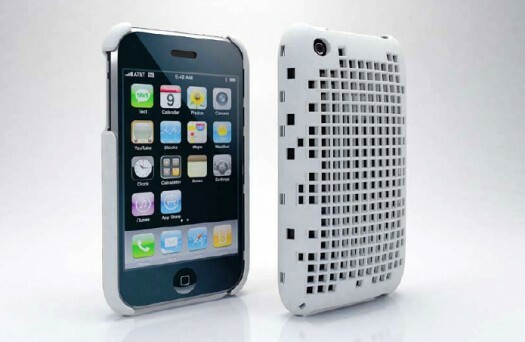 Now you have the inspiration and the resources to make a iPhone product yourself. Go for it.